flve-carbon sugars, which are later fermented and distilled into ethanol. Normal yeast does not ferment the 5-carbon sugars, so genetically modified, delicate and patented yeast strains are used. Iogen's plant has capacity of 1 million gallons of ethanol per year. The only published ethanol production is shown in Fig. 2.12. • 158,000 gallons/year of anhydrous ethanol (EtOH), or 10bbl EtOH/day = 6.7 bbl of equivalent gasoline/day were actually produced. In press interviews, logen claims to be producing 790,000 gallons of ethanol7 per year. • There exists 2 x 52, 000 = 104, 000 gallons of fermentation tank volume. • The actual ethanol production and tank volume give the ratio of 1.5 gallons of ethanol per gallon of fermenter and per year. 6 Cellulose Ethanol is ready to go. Renewable Fuels Summit, June 12, 2006. 7 It's Happening in Ottawa - Grains become fuel at the world's first cellulosic ethanol demo plant, Grist, Sharon Boddy, 12 Dec., 2006. It is possible that the notoriously innumerate journalists confused liters with gallons: 790,000 liters is 200,000 gallons, much closer to the published data from Iogen. • Thus, there is ca. 4% of alcohol in a batch of industrial wheat-straw broth in contrast to 12 to 16% of ethanol in corn-ethanol refinery broths. Since wheat is the largest grain crop in Canada, I use its straw as a reference (the other two straws are similar). 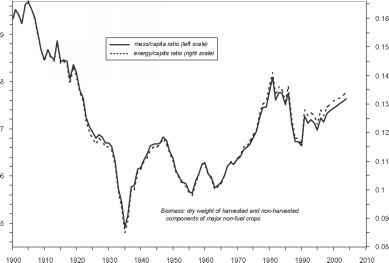 On a dry mass basis (dmb), wheat straw has 33% of cellulose, 23% of hemicelluloses, and 17% total lignin.8. Other sources report 38%, 29%, and 15% dmb, respectively, see (Lee et al., 2007) for a data compliation. These differences are not surprising, given experimental uncertainties and variable biomass composition. To calculate ethanol yield, I use the more optimistic, second set of data. The respective conversion efficiencies, assumed after Badger (2002), are listed in Table 2.1. The calculated ethanol yield, 0.18 kg EtOH (kg straw dmb)-1, is somewhat less than a recently reported maximum ethanol yield of 0.24 kg/kg (Saha et al., 2005) achieved in 500 mL vessels, starting from 48.6% of cellulose. Simultaneous saccha-rification and fermentation yielded 0.17 kg/kg, see Table 2.5 in Saha et al. (2005). Because enzymatic decomposition of cellulose and hemicelluloses is inefficient, the resulting dilute broth requires 2.4 times more energy to distill than the average 15MJL-1 in an average ethanol refinery (Patzek, 2004; Patzek, 2006a), see Fig. 2.13. One may argue that Iogen's Ottawa facility is for demonstration purposes only and that the saccharification and fermentation batches were not regularly scheduled. In this case, an alternative calculation yields the same result: At about 0.2 to 0.25 kg of straw/L, the mash is barely pumpable. 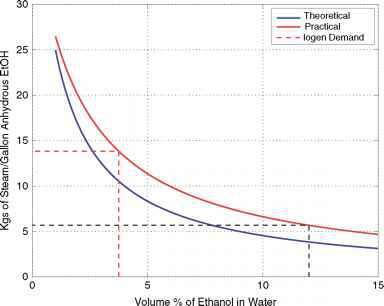 With Badger's yield of 0.18 kg/kg of EtOH, the highest ethanol yield is 3.5 - 4.4% of ethanol in water. The higher heating value (HHV) of ethanol is 29.6 MJ kg-1 (Patzek, 2004). The HHV of wheat straw is 18.1 MJ kg-1 (Schmidt et al., 1993) and that of lignin 21.2 MJ kg-1 (Domalski et al., 1987). 8 Biomass feedstock composition and property database. Department of Energy, Biomass Program, www.eere.energy.gov/biomass/progs/searchl.egi, accessed July 25, 2007.
where the density of ethanol is 0.787 kg L-1 and the entire HHV of lignin was used to offset distillation fuel (another optimistic assumption for the wet separated lignin). This calculation disregards the energy costs of high-pressure steam treatments of the straw at 120 or 140°C, and the separated solids at 190°C, sulfuric acid and sodium hydroxide production, etc. Also, the complex enzyme production processes must use plenty of energy. The Iogen plant in Ottawa, Canada, has operated well below name plate capacity for three years. Iogen should retain their trade secrets, but in exchange for the significant subsidies from the US and Canadian taxpayers they should tell us what the annual production of alcohols was, how much straw was used, and what the fossil fuel and electricity inputs were. The ethanol yield coefficient in kg of ethanol per kg straw dmb is key to public assessments of the new technology. Similar remarks pertain to the Novozymes projects heavily subsidized by the Danes. Until an existing pilot plant provides real, independently verified data on yield coefficients, mash ethanol concentrations, etc., all proposed cellulosic ethanol refinery designs are speculation.